A few months back, I attended the North American Handmade Bicycle Show (NAHBS) in Richmond, VA. I had planned on blogging profusely about the host of treasures I came across. I managed to get out a handful of posts, but life kinda got in the way and I was forced to scale back my ambitions. However, there was one thing that I witnessed at the show that I simply had to share. The NAHBS was filled with some amazing stuff, but the following picture that I took in the booth of Shamrock Cycles is what captured my attention and imagination more than anything else. It's a heart! I know - you're thinking, "Paul, it's a heart - big deal". Yet look at the picture again. It's a heart, through the seat tube!! 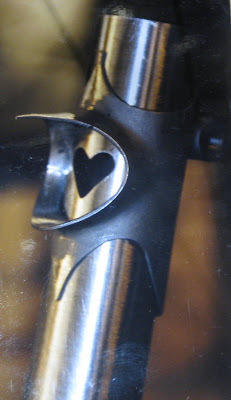 I know - you're thinking, "Paul, it's a heart, through the seat tube - big deal". Yet look at the picture again. It's a heart, through the seat tube, inserted in the lug joining the top tube, seat tube and seat stays!!! 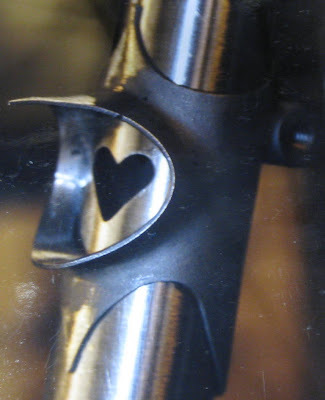 I know - you're thinking, "Paul, it's a heart, through the seat tube, inserted in the lug joining the top tube, seat tube and seat stays - big deal". Yet look at the picture one more time. 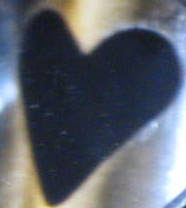 I ask you, based on the location of this heart, what will happen to it once the bike is complete? It will be hidden. That's right, you will never see it. Now, from an engineering perspective, I understand that a hole is needed in all the tubes to provide a vent during the brazing process as well as a path for lubricating the ID of the tubes. However, that practical purpose is easily served by drilling a simple hole. 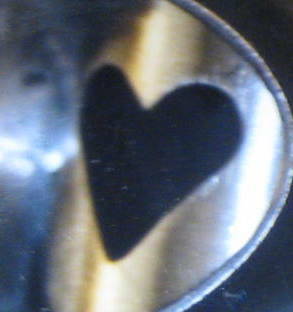 Why go through the trouble of carving a heart, where a simple hole will do? Why go through the trouble of carving a heart in a place where no one will ever see it? There are no practical answers to those questions. It's all about the love between builder and bike. If a builder is that meticulous about that which is unseen, can you imagine the quality of the rest of that bike? Try to get your mind around that and enjoy the rest of the bike. On my ride home today, a drop dead, gorgeous blonde, riding a bike, pulled out of a side street some 100 yards in front of me and proceeded in the same direction as myself. She was wearing a tightly fitting, white, sport's bra and black lycra shorts. Her arms, abs and legs were well toned and tanned. Her long blonde hair was tied in a pony tail that swung provocatively to and fro. a. I might get a better view. b. She might have the pleasure of lusting at my muscular glutes as I pedaled away. Over the course of the next quarter mile, I slowly, but steadily gained on her. The distance between us had been cut in half when I reached a crossroads, both literally and figuratively. She was quickly approaching the road upon which I normally turned on my commute home. With every fiber of my masculinity, I longed for her to turn. Imagine my disappointment when she kept going straight. What happened next haunts me more than my feeble grasp of the English language can do justice. First - As I traversed the next 50 yards I wrestled with what to do. Should I turn and head home or should I go straight? I couldn't believe it. Here I was 50 yards behind the girl of my dreams. At my current speed I was sure to overtake her in the next quarter mile. Yet, I was actually wrestling about what to do. That kind of dilemma is akin to jumping into a lake and debating whether to sink or swim. There's no internal struggle - you instinctively swim for God's sake. There was a time, in what I hope is the not to distant past, that I would have chased this chick around the globe. Yet now, I find myself wrestling with whether to venture from my normal route for but a mere quarter mile. Secondly - I reached down and switched to an easier gear, grabbed the grips of my North Road handlebars, sat up straight, eased my pedaling cadence and then - oh the shame - I turned! While I may not like it, I've come to accept the unfortunate fact that if I'm gonna commute to work via a bicycle; well, then I'm gonna have to contend with near misses. I was cruising down the main thoroughfare to my place of employment. I have perfected my route over the years so as to avoid said thoroughfare to the maximum extent practicable. The operative words in that sentence are "maximum extent practicable". Unfortunately, there is no convenient way to get to work without venturing upon this thoroughfare, even if briefly. For me that's about a 1/4 mile section, along which residents parallel park on the street. This leaves 3 lanes for the moving traffic. I have commuted long enough and read enough blog entries to beware of the dreaded "door zone", that 3 to 4 foot area adjacent to parallel parked cars where, were an occupant to open their door, there would not be sufficient room for cyclist and automobile door to occupy the same space simultaneously. The result, cyclist runs into door at 18 miles an hour and is thrown into traffic where they are summarily run over or the cyclist takes evasive maneuvers and instinctively swerves into traffic where they are summarily run over. As my astute readers can tell, the result of both options is the cyclist is "summarily run over". To avoid said fate, I avoid door zones at all cost, which means that I ride far enough into the lane to essentially take over that lane and force the following cars to change lanes and go around. I don't see this as being particularly taxing on the drivers in that they have two other lanes to choose from. As minor as this inconvenience is to motorist, I try to minimize it further by watching in my mirror and timing my excursion into the lane so as to avoid hampering automobiles if at all possible. I approached a parallel parked car and noted in my mirror that I had plenty of time to get by before the approaching automobile passed. I cleared the parallel parked car and respectively moved to the right, OUT of the lane of traffic. Imagine my horror when the automobile approaching behind buzzed by my at 40 mph with only inches to spare between my arm and it's mirror. In order for him to be that close, the driver had to have swerved out of the traffic lane and onto the shoulder of the road I occupied. This encounter unnerved me more than words can express. I've grown accustomed to be yelled at, honked at, cut off, turned into and the like. All these encounters were largely the result of oblivious drivers who are not programmed to acknowledge my existence. This encounter though was completely different, This driver purposely went out of his way to swerve toward me in a sick, sadistic and reckless gesture that greatly endangered my life. My dear readers, as you have no doubt surmised by now, I have been guilty in the past of slightly exaggerating the facts for literary effect. Let me assure you that in this encounter, I do not do justice to it's gravity. I don't know what that reckless driver's motivation was. Whether he was wanting to scare me, was joking around or was angry. Frankly, I don't give a damn. The simple fact is, no matter his reason, he was in no way, shape or form, justified in using his 4000 lb SUV to threaten my well being. The thing that really pisses me off is since that encounter is that I have found myself, more often than not, venturing on the sidewalk (legal in VA) in that particular section of my commute. I realize that an argument could be made that I am in essence giving that reckless driver exactly what he wants. While I do not fear death in the least, I am in no particular hurry to hasten it approach. I can't control other people's actions, only my own. I wish that automobiles and bikes could coexist amicably. The reality is that we (bikers and drivers alike) have a long ways to go to get to that nirvana. Until then, I'm going to keep riding, even if it means an excursion here and there on the sidewalk. Did I mention how much that pisses me off? Sometimes, life is like riding a bike through a tunnel. It is dark and lonely and cold and frightening. Turning around is not an option, cause it's just as dark behind you. Stopping is not an option cause then the darkness just closes in around you. You really only have one choice, point your handlebars toward the small light at the end and keep pedaling. Before you know it, you're leaving the darkness behind and riding back into the glorious warmth of the light. Funny thing is once you find yourself back in the light of day and you turn around and look back at where you been, the tunnel doesn't seem near as dark or long or imposing. About a month ago, I came home from work on a Friday, threw a few things on my Cargo Bike and rode off to Sandy Bottom Nature Park. It was a mere 3 mile ride from my house that I covered in exactly 15 minutes. I rode to a nearby grocery store for beer and ice and then skipped over to a Mexican restaurant next door for chips and salsa. I spent the rest of the evening chillin on TOP of the picnic table (namely cause Sandy Bottom has the highest population of canebrake rattlers than anywhere in Hampton Roads), drinking my beer, eating my chips and feeding wood into the fire. Just As I was about to head over to the tent for bed, a nearby camper came sauntering over. 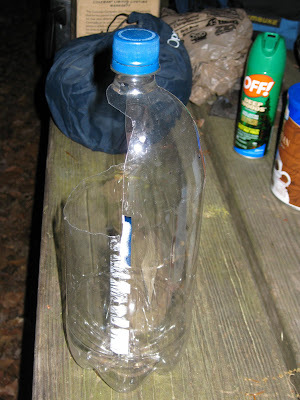 He said hi and handed me what he categorized as his own patented version of a tent bottle. He then bid me goodnight and walked away. It was a 2-liter bottle with a hole strategically cut on one side, towards the top. Most people would have found this gesture to be rather disgusting, but I thought it an act of kindness on the part of a stranger. It's encounters like this one that remind me that there is still a lot of good in the world. With tent bottle in hand, I climbed in my tent, turned on the IPOD touch and read a few minutes. That night, I slept like a baby. The next morning, I brewed a pot of coffee, sat back on TOP of the picnic table (don't forget the snakes), drank a few cups and then started packing my gear. I was back home by 8:30 Saturday morning. My first "sub-24 hour overnight" (S24O)bike/camping trip was in the books. The following Monday, when I mentioned my mini adventure to my co-workers, they looked at me rather puzzled and for the life of them couldn't understand why a grown man would jump on his bike, ride 3 miles and camp. They thought me strange indeed. From my perspective - I was on my bike - off the grid - completely self sufficient - with plenty of cold beer, chips and salsa and the proud, new owner of my very own tent bottle. That's Living!!!! Riding solo on the New River Trail gave me plenty of time to think. My thoughts wandered in time to the trail's earlier days. To before it was a bike trail. To the back breaking work of chiseling out these mountains to make a level foundation upon which to lay the tracks. I found myself imagining the times when trains lumbered through these mountains and along this river. I put myself in the Engineer's seat, leaning out the window of his engine, riding along with his own thoughts. Letting the wind blow in his face. Drinking in the beauty of the surrounding wilderness. Lucky for me, the beauty that beset that Engineer's eyes many years ago, has not faded. The physical evidence of the railroad are largely gone now; largely, but not entirely. As I rode along, I happened upon remnants of those days gone by, to subsidize the images in my imagination. As I chugged along under my own power and my thoughts wandered, I could have sworn that a time or two, the deep silence of the forest around me was interrupted by a faint, almost indiscernible whistle. It wasn't a new sound, but instead one that had been emitted generations before, but it's echo still lingered. The weather was iffy for my weekend ride on the New River Trail. I'm happy to report that the whole time I rode, it was dry. However, evenings (all three) were a different story all together. I could tell stories of each evening, but by far the most eventful was the second, the one I spent at the Cliffview Campround just outside of Galax. Evening was fast approaching, my camp was all set up and dinner was almost cooked. I noticed dark clouds quickly gathering above and I could hear distant thunder rolling down the valley, growing ever louder and closer with each ominous clap. Not liking the sound of Old Man Mountain's applause, I decided to take some precautionary steps and moved my stuff inside the tent. I had just finished filling my bowl with a hot meal of beef tips and broccoli on rice when the first heavy raindrop fell and on the heels of that first drop a deluge. I grabbed my food and wine and dove in the tent. There I was huddled in my tent in the darkness as a veritable tempest raged unabated outside it's thin, cloth walls. To the not so soft glow of lightning flashes, I ate my meal and drank my wine. The storm had been raging unabated for more than an hour when the park ranger drove through the campground, repeating an announcement over his PA system, "attention campers, there is a severe line of storms approaching the area with damaging wind and hail. You are advised to seek shelter in your vehicle immediately." As the ranger drove away, I sat in complete darkness pondering my predicament. My vehicle was locked to the picnic table some 20' away. Bikes are amazing vehicles, whose virtues I could expand upon endlessly. However, I doubt that it would do me much good in a hail storm. I really was left with but one option, nestle down in my tent and ride it out. I was encouraged that my shelter was a brand new REI Quarter Dome tent. I spared no expense on choosing this tent, now it was time to see if my investment was worth it. I lay down, put my earbuds in my ears, closed my eyes and let my Itouch do the talking. Occasionally I would pull out the ear pieces and was disconcerted by the raging fury of the storm. To maintain some semblance of sanity, I put the earbuds back in place, lay back and closed my eyes. My philosophy: out of sound - out of mind. The next morning, I awoke to silence and crawled out of my tent. A heavy fog blanketed the area. There were two other groups in the campground beside myself. The one nearest was a father and his two grown sons. They each had their own tent and all 3 were flooded. They ended up seeking shelter in their vehicle for the night. The other was a father and his small son. Their tent was completely destroyed. Take note of the big, burned out spot on top, where it had been blown into the adjacent fire pit. They ended up not only seeking shelter in their vehicle, but jumping in it and riding away from the devastation. As I prepared and enjoyed a few cups of coffee, I looked around at the devastation around me and the tidiness of my camp and was grateful for two things. First I was grateful to God that he saw me safely through the night. Secondly I was grateful that I had the foresight to invest in a good tent. My dear readers, I beg of thee, heed my sage advice. If you ever venture into the wild, something I hope you do, spend some extra money and get some good gear. Cause I'm here to tell you, it's not a question of if, but when, you will encounter the fury of Mother Nature. Your gear will be the only thing standing between your comfort or your desperation. Oh yea - when the winds blow, the lightning flashes, the thunder booms and the hail descends, it wouldn't hurt to utter a prayer as well. On my ride home from work yesterday, I took a detour through Mariner's Museum Park. I stopped at one of my favorite, secluded spots in the park and sat on a picnic table to spend a little quiet time. No sooner did I sit down, when I noticed some 50 yards away, in the middle of a field, a drop dead gorgeous blonde, sitting on the ground. The operative word here is "blonde", which should come as no surprise to regular readers of this blog. This young lady was busy working on a 2 foot diameter cylindrical object, shaped out of what appeared to be sticks. She was weaving something in and out, up and down, around and about this coarse, wooden frame. I sat down for at least 40 minutes and not once did this young lady take a break from her task. She steadfastly bent over her creation, steadily weaving. As I rode away, I steered in her direction and stopping nearby, inquired, "hello, I don't mean to intrude, but I was just curious, what are you sitting in the middle of this field making?" She flashes me a beautiful, captivating smile and says, "Oh - it's a dreamcatcher, I've always heard about single plane ones, I thought it would be neat to make one with triple planes." A "dreamcatcher", a traditional, American Indian ornament which, according to legend, is supposed to snare bad dreams in its web and only allow pleasant ones to pass through. For those of you who traverse back and forth to work in your internally combustion powered, sheet metal cages, I have a simple question for you. "When was the last time, on your drive home, you happened upon a young, drop dead gorgeous blonde busily weaving a 3 plane dreamcatcher?" As you fumble for an affirmative response, one that will never come, I present to you yet another advantage of bike commuting. As I traversed a trestle spanning the New River at Fries Junction. I picked up a riding partner. When I watch a butterfly flutter about, I am struck by it's beauty, it's agility and it's playfulness, but I've never been particularly impressed with it speed. This 1,089 foot ride with my new riding partner, changed all that. Not only was he able to hang with me as I pedaled along at a whopping 12 mph, but he literally flew circles around my head in the process.